locate and lands fish in the dead of winter. Imagine your home growing darker by the day, to the point you haven’t seen sunlight in over a month. Moreover, your surroundings are growing colder by the day. In fact, it’s so frigid that your muscles have become rigid; to the point it’s all you can do to muster moving a few feet…even to eat. And you’re hungry. To say life’s registering a zero on the fun-o-meter is an understatement. And with that lowly scenario in place, you now know what it’s like to be a fish living in the Ice Belt during the dead of winter. It’s been a long time since light penetrated the surface and temperatures are at the coldest they will be all year. To boot, the lack of vegetation, rain and wave action have oxygen levels dwindling rapidly. And it’s this combination of factors that make midwinter a difficult time to catch fish. But if you’re game to put in the time, find those oxygenated zones, rewards are paid in bites and fillets. 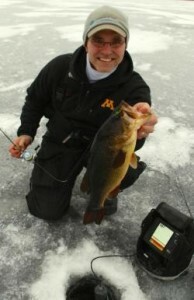 Minnesota Ice-Fishing Guide Brian “Bro” Brosdahl is no stranger to fishing shallow, heavily snow-covered lakes. The Grand Rapids, Minnesota resident moves around a lot. And uses specialized electronics to find panfish other anglers often overlook. “I drill a lot of holes and check every one for any signs of life,” said Bro. “If fish are right under me I’ll see ’em on the ‘Bird, and, because of the ultra-sensitivity settings on the Humminbird ICE HELIX 5, I can put my jig right in their faces. Paying close attention to the underwater viewing system’s screen the moment its camera hits the water, Bro starts spinning the lens right the bottom of the hole. Oftentimes, panfish will be literally inches away, curiously inspecting the corded device. Once fish are revealed, Bro removes the camera, strips off a couple feet of line and lowers his jig—tipped with either spikes, wax worms or mousies. If there are a lot of fish just under the surface, Bro will operate out of his Frabill flip-over. The darkness not only allows Bro to see the fish better, but also camouflages the fact he’s above by muting his silhouetted movements. When oxygen levels are low, and fish lethargic, Bro uses tiny jigs with a slow fall. His preferences are Northland’s new Impulse Helium Mayfly, Stonefly and Waxyfly. Custom Jigs & Spins’ Nuclear Ant, Ratso and Shrimpo are another trio of lifelike lures that sink slowly. When Walleye Tournament Pro Mark Brumbaugh targets pike, walleye and jumbo perch late in the season, he searches out river and creek mouths. Because there’s more dissolved oxygen near inlets, fish will be spread throughout the water column. Subsequently, Brumbaugh likes larger, heavier jigs that can move up and down quickly. Bladebaits are one of Brumbaugh’s go-to lures in stained water as they produce a lot of vibration. Reef Runner’s Cicada is one of his favorites. He also employs Custom Jigs & Spins’ B3 Blade Bait and new Rotating Power Minnow (RPM) swimming bait. Aqua-Vu optics and fishes in real-time with an AV Micro DT in a Micro-Mobile Pro-Vu Case. As avid anglers will tell you, late winter can be one of the toughest times of the year. But maybe that’s because they weren’t looking in the right places. Some fish might be right under foot; literally, mere inches under the ice. If this is the case, use light lures with a slow flutter and fall. In waterways with inlets, search out the entire water column with lures that sink fast so you can get the lure to fish before they turn tail. This entry was posted in How To Fish, Ice Fishing on February 11, 2016 by ronniegarrison. 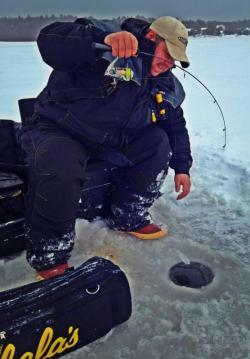 What Are Some Panfishing Tips for Ice Anglers? A Custom JIgs & Spins ‘Gill Pill jousts soft plastic Noodels to create a delicious horizontal-hung spider from Mars. 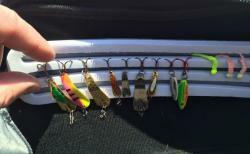 Pick a panfish jig. But not just any panfish jig. You want one that quivers like crappie candy; moves like bluegill food. Color matters, too. Ditto for body shape, profile, texture and, sometimes, taste. Turns out, paying attention in math class really did matter. For in the real world of lure selection, the difference between bites and actual hooksets boils down to one critical choice: When to go vertical and when to hang horizontal. Offering an optimized hook angle, the tournament-proven Chekai Tungsten Ice Jig fishes fast and active. It’s the perfect jig for pairing with plastics, particularly a Custom Jigs & Spins Wedgee plastic, or even a writhing mass of live larvae. Either way, the Chekai’s jighook is ultra sharp, with plenty of extra gap to set itself sweetly and securely in a panfish’s lip. Fishing precisely horizontal, the hook itself “tips down” slightly, a fine-tuned detail that assures the hook always finds home. The Custom Jigs & Spins tungsten Chekai fishes fast and horizontally, and with its freakishly sharp, wide and unturned hook, sticks fish with amazing precision and consitency. To turn the tables on panfish in shallow vegetation or other valuable vertical scenarios, Custom Jigs & Spins’ VertiGlo Demon remains a classic tactic. Finished with a chip-resistant, long-lasting glow paint, this perpendicular panfish jig maintains an upright posture at all times. Yet the hookpoint stands out at 90-degrees from the body—again, the optimal angle for vertical jig tricks. Adding extra polish to each of these optimized jigs, the Wedgee plastic looks, feels and swims like a living thing. Poured with a super-fine, tapered body shape, this sweet little softbait is the ultimate ice-fishing inducement. The Wedgee’s super versatile, too. Fish the 1.75-inch plastic whole. Trim the head and thread it onto a jighook. Present it wacky-style, t-boned onto a Demon Jig for a lethal “vertizontal” posture. No matter what you do, the Wedgee’s tail just keeps on quivering. Try to stop it. Can’t be done. Also unlike live bait, it never dies. We’re not suggesting you go back to school. Nor to revisit Geometry 101. Thankfully, the fishing folks at Custom Jigs & Spins have already aced the final exam, gifting anglers with A+ ice jigs that attract, trigger and most importantly, hook every fish that bites. Custom Jigs & Spins started almost 30 years ago producing high quality ice fishing lures. This entry was posted in Ice Fishing on January 14, 2016 by ronniegarrison. The frozen surfaces of lakes, rivers and reservoirs across the ice belt represent the final frontier in angling. Ice thicknesses that are often measured in feet, air temperatures that hover near zero, and frigid winds that often carry frozen precipitation all represent physical, and even psychological barriers to ice fishing success. Over the last 5 years, however, advances in marine electronics that were initially designed to assist open-water anglers have begun to breach the final frontier, providing shelter-bound ice fishers the technological advances they need to enjoy sustained success throughout the months-long hard water season. As the first intrepid anglers begin to creep onto frozen lakes this season, we caught up with noted guide and angling technology expert Dr. Jason Halfen, to tap his insights on how marine electronics can best be applied to ice fishing situations. 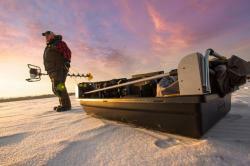 “Whenever I lead groups onto the ice, we always carry a set of three tech tools to help us find and catch fish. This trifecta includes a portable, digital sonar/GPS combo with an installed GPS mapping chip, mechanical flasher unit for each angler in the group, and set of underwater cameras to visualize activity beneath the ice,” began Dr. Halfen, who owns and operates The Technological Angler, a company dedicated to providing technology training to contemporary anglers. “Each component of the technology trifecta has a specific purpose, and this unique combination helps my groups find and catch more fish throughout the season.” We continued our conversation by exploring the role of each component of Halfen’s “Tech Trifecta” in more detail. Dr. Halfen explains, “A portable digital sonar/GPS combo, like the new Humminbird ICE HELIX 5 SONAR GPS, is the command center for my groups of ice anglers. The GPS feature, combined with digital cartography from my Humminbird-LakeMaster chip, helps us to rapidly identify key locations to target panfish by day, and other areas to chase walleyes during low light periods. Once likely spots are located and holes are drilled, the HELIX command center seamlessly transitions into sonar mode to help anglers monitor fish, and baits, beneath the ice. “All Humminbird digital sonar/GPS combos feature a dedicated ice fishing mode, which displays 2D sonar data on the traditional, circular “flasher wheel” display that we all grew up with during ice fishing’s infancy. 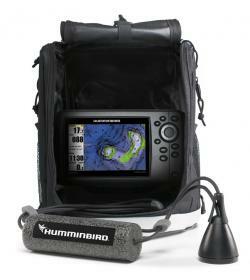 The new Hummnibird ICE HELIX 5 SONAR GPS merges modern mapping with refined digital sonar to stand as the most advanced combo-unit ice fishing has ever seen. Every army needs both a commander and a set of highly trained foot soldiers. In Dr. Halfen’s “Tech Trifecta”, the HELIX is the commanding officer, while a platoon of Humminbird ICE 55 and ICE 35 flashers carry the tech burden of finding and catching fish onto the icy battlefield. With such a heavy emphasis and reliance on the HELIX digital sonar/GPS combo, I asked Dr. Halfen why he would outfit his clients with mechanical flashers like the Humminbird ICE series, rather than handing each their own digital fish finder. As always, his answer is rooted heavily in the exacting physics of sonar science. “It’s really all about the sonar frequencies that each unit is transmitting. Put too many units, all transmitting the same sonar frequency, in too small an area, and nobody is going to be able to see anything as all of the units will be interfering with each other. My HELIX sonar/GPS combo transmits standard open water sonar frequencies of 200 kHz and 83 kHz. In fact, if you look across all of the ice fishing sonar units available today, nearly all transmit at 200 kHz. This leads to a heavy reliance on noise filters and interference rejection schemes, which sometimes work, but oftentimes don’t. I prefer to address the problem at its source, rather than try to eliminate pesky, and persistent, sonar noise. As valuable and irreplaceable as sonar is to contemporary ice fishing, visual information from underwater camera systems can help elevate the stream of insights delivered to the ice anglers to an entirely different level. Dr. Halfen refers to his Aqua-Vu underwater camera systems as his “spies”, covertly delivering tactical real-time visual intel. “We use Aqua-Vu camera systems exclusively, in part because of their convenience and ease of use, but also because they offer us distinct advantages for finding and catching fish. First of all, systems like my Micro 5 fit completely within the front pocket of my Frabill I4 bibs. Their internal Lithium battery packs outlast even my longest days on the ice. And Micros weigh next to nothing, especially when compared to other camera systems on the market that seem to come with their own zip codes. “When it comes to finding and catching fish, my Aqua-Vu camera allows me to conclusively identify bottom substrate, like telling the difference between sand and mud, which is a significant advantage when we are chasing perch that forage on mudflats. My underwater camera is also the primary tool that I use to distinguish between healthy green weeds, and their lifeless, brown counterparts. Ice fishing has evolved well beyond its early days of chisels to cut holes and lead weights to estimate depths. The technology explosion that has revolutionized open-water fishing now stands on the threshold of frozen lakes, fishing’s final frontier. These tech tips from Dr. Jason Halfen will help you tap into that torrent of electronic fish-finding information, so that your ice fishing adventures this winter are met with a bounty of hard water success. Learn more about the ways that modern technology can improve your fishing by visiting The Technological Angler online. This entry was posted in Ice Fishing on December 24, 2015 by ronniegarrison. For many people, fishing is the most relaxing way to spend the day. And in the winter months the most popular angling activity is ice fishing. To those who have never tried it, ice fishing is sometimes looked upon as an oddity, but for others, ice fishing is the best kind of fishing. Although it doesn’t appeal to all, many anglers actually prefer fishing through the ice to open-water fishing. For one thing, anglers can get just about anywhere on the lake during ice fishing season, something they can’t do without a boat during the open water season. Virtually every fish that’s available to anglers in the summer can be caught through the ice – some are even caught more frequently in the winter. Just walking on the ice can be a unique experience, especially when no snow obscures the view of the water below. However, as with any outdoor activity, safety should be your top concern. When it comes to ice safety, you should steer clear of dark spots or places where the snow looks discolored. Some other good rules to follow include: 1. Never fish alone, 2. Tell someone where you are going and when you expect to return, 3. Always test the ice with a spud (described later), 4. Take the appropriate emergency items, such as a lifejacket and ice picks, and 5. Take a cell phone with you in case you need to call for help. Dress in your warmest winter clothes; fill a thermos with hot coffee, chocolate or tea; and bring an empty bucket or old lawn chair to sit on. To get started ice fishing, you’ll need the basics: something to make a hole in the ice, something to clear the hole and keep it open and ice free, and something to fish with, or equipment. The two basic tools used to make holes in the ice are spuds and augers. A spud features a long-shank with a chisel-like end that’s used to chip a hole in the ice. A spud is a tool you use when the ice isn’t too thick. An auger is a corkscrew-like device with a cutting blade that operates like a hand drill to make a hole in the ice. For extremely thick ice, power augers that run on batteries or small gasoline engines are available and make creating holes much easier. Once the hole is created it needs to be cleared of ice chips or slush. A skimmer (or a slush scoop) is a small cup with holes in it (to let the water run out) on a long handle. It is inexpensive and perfectly suited for the job. A skimmer is used to clear the hole right after it’s made, as well as throughout the day if it’s particularly cold and if additional ice forms. Please note the size of the hole is important. The hole must be big enough that you can get a fish out, but not too large of a hole that it may endanger someone’s life. Anglers are recommended to keep their holes to a maximum of eight to 10 inches in diameter which would accommodate the size of most fish species. When abandoning fishing holes, anglers should mark them with a tree branch, sticks or chunks of ice to alert others of their presence. Ice fishing equipment can be divided into three basic categories: hook-and-line, tip-ups and spears. Most hook-and-line anglers use short, limber rods with reels or simple spring-tension spools to hold the line. Sometimes they may use something as simple as a couple of pegs on the rod handle used to wrap the line around. Limber rods allow the use of light line, which usually results in better fishing and absorbs more of the shock when fighting fish. Hook-and-line anglers use live bait, artificial lures or sometimes both to catch many different species of fish. Anglers often use small lures, such as teardrops or flies, with live bait – such as wax worms (bee moth larva), spikes (fly larvae), wigglers (mayfly larvae) or minnows – attached to the hook for better action. The bait can be fished without movement or jigging can be used to attract the fish. Jigging is most successful if a lure of any kind is used. Hook-and-line anglers have the choice of using a bobber on the line, just as they would while fishing in the summer. Some may also fish with a tight line and use a spring bobber, which is a small strip of metal or wire that extends off the rod tip like an additional eye on the rod. Any motion alerts anglers to the bite, a bonus for small fish or light-biters. Generally, anglers begin by fishing near the bottom and work their way up in the water column until they locate the fish, then continue to fish at that same depth. Anglers can use bobbers to set their baits at a preferred depth or fish a tight line, either fishing without movement or jigging. For bigger fish, anglers use heavier gear with larger lures or bigger hooks which allows them to use larger baits – minnows, smelt, salmon eggs or spawn bags. Anglers generally start at the bottom and gradually move up in the water column when jigging, while those fishing with live bait, spawn bags or salmon eggs generally fish right off the bottom. Some anglers prefer to fish with tip-ups, which are devices set on the ice above the hole that dangle the bait (most often minnows) beneath them. Tip-ups, which feature small reels submerged in the water, get their name from a flag that’s bent over and attached to the reel. When a fish takes the bait, the reel turns and releases not only line, but the flag as well. The flags’ “tip up” action alerts the angler to the fish taking out line. Tip-ups are usually spooled with heavy, braided line. Often an angler who is fishing with a rod will also set a tip-up in a different hole, giving them two ways to catch a fish and giving them an opportunity to fish for different species, or more than one fish, or at two different but close by locations. Spearing is another form of ice fishing that is a more specialized but traditional sport. Anglers who spear cut large holes in the ice, usually with an ice saw or chain saw. They fish from tents or small shelters commonly called shanties that can be portable or more permanent (or at least as permanent as the ice is). The shanty blocks the light, allowing anglers to see down more clearly in the water in order to spear the fish. This has given rise to the term dark-house spearing. Spearing anglers generally dangle decoys or large live baits (such as suckers) in the water to attract their target fish. They utilize spears that typically have a substantial weight to them and have seven to nine tines on the end of a seven-foot handle. 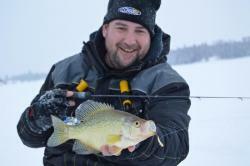 The most common species hook-and-line ice fishermen are looking for are panfish: bluegill, sunfish, perch and crappie. Tip-ups are generally used for larger game fish, such as northern pike, walleye and various trout species. In Michigan, spear fishermen are allowed to target northern pike, muskellunge, lake sturgeon and many other species. There are many restrictions associated with spear fishing and anglers should read the annual Michigan Fishing Guide for more information. A basic tip for all three ice fishing methods is that the most success is seen around dawn until mid-morning and again from late afternoon until sundown. This is especially true for panfish and walleye. Some species can be more aggressive at other times during the day, such as northern pike. It’s also important to understand that fish are more sluggish during the winter and move around less, especially during the middle of winter when ice thickness and snow cover is the heaviest. The more holes anglers cut and try, the better their chances are for locating aggressive fish. One common piece of equipment nearly all types of anglers who ice fish utilize are electronic fish finders. These help anglers locate both aggressive and non-aggressive fish and make it easier to determine if your holes will be active and how present fish are reacting to your fishing methods. It’s important to be prepared to face the elements when you go ice fishing by including these items: shelter and apparel. Ice fishing can be a fairly cold activity, especially on those windy days when it doesn’t seem fit to be outdoors. On such days, a shanty is almost a requirement. Many portable shanties are available at your local sporting goods store, although some anglers, especially in northern Michigan where the ice fishing season can last for many months build elaborate but removable shanties on the ice. These may have insulated walls and many of the comforts of home. 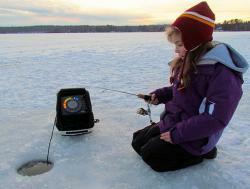 Propane heaters can keep them warm and help keep the fishing holes from freezing. But even a simple windbreak, made of plywood or particle board, can help. A sheet of plywood, cut in half and hinged, makes a simple windbreak. If skis or runners are added to one side, then it can easily be pulled across the ice. It’s important to note that all shanties must be removed from the ice by a certain date, appropriate to the zone in which you are fishing. When removing a shanty, anglers must also remove any and all garbage affiliated with the structure, including plywood and propane tanks. On less harsh days, many anglers can be seen on the ice on portable folding stools or overturned five-gallon plastic buckets. Buckets often double as gear carriers. Anglers can fit their rods, lures and baits into a bucket and easily carry them out on the ice with them. In many cases, anglers build gear boxes, often on sleds or skis, which they can pull behind them. The creativity of Michigan anglers can regularly be seen on the ice as many have built sophisticated devices to transport their gear and to insure their comfort. Anglers who go out on the ice with or without shelters must dress for the weather. Anglers should dress in layers so they can add or remove them as the temperature changes. Many items of clothing – such as bib overalls, coveralls and fleece jackets – are made of modern lightweight fabrics that provide surprising warmth. Anglers should consider wearing a layer of thermal clothing against their skin that absorbs sweat and wicks moisture away from the body, thus keeping the angler warm. Anglers can break a sweat trudging across the lake, especially if they’re pulling a load behind them. One should also have on an outer layer of a wind-breaking fabric. Waterproof boots are a must and a pair of moisture-wicking socks under wool socks will help to keep anglers’ feet warm and dry. Although the idea of going ice fishing may seem daunting, many fishing clubs and sporting goods stores hold annual ice fishing clinics where anglers can learn the basics. 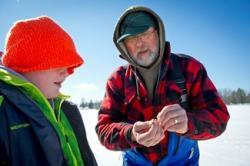 A number of Michigan state parks, interpretive centers and fish hatcheries also host programs during the winter months that teach basic techniques and offer hands-on experience. Ice fishing may not be for everyone. But if you’ve ever driven by a Michigan lake in the winter and have seen the “shantytowns” out on the ice, you can tell plenty of people consider ice fishing to be a pretty cool sport. This entry was posted in Ice Fishing on December 23, 2015 by ronniegarrison. Are You Ready for First Ice? 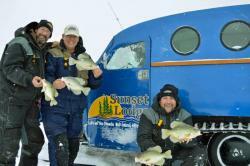 Anglers await the arrival of the first ice of winter with great anticipation. The short-lived first ice bite is classically one of the best of the winter, with active fish still found in near-shore, oxygen-rich waters that are easily accessible to the walk-on angler. My early season ice fishing adventures are governed by three guiding principles: stay safe, travel light, and fish shallow. Read on to learn about the tools that I use to accomplish these goals, AND return home with a pail of fish. Early season hard-water adventures often occur on frozen lakes that are capped by a relatively thin layer of ice. I heed the well-publicized guidelines distributed by my regional Natural Resources managers, which generally indicate that 4-inches of hard, black ice are suitable for foot travel. On frozen lakes that have not been previously accessed by other early season anglers, I will check ice thickness along my walking path using a spud bar, which is, in essence, a long-handled ice chisel. If I measure less than 4 inches of ice thickness, I will turn back toward shore. Even with general ice coverage of 4-inches or more, thin spots may persist in the early season due to springs, current, or even the action of schools of fish or flocks of waterfowl. It is important to have a plan to get back onto the ice surface, should you fall unexpectedly through the ice. My Frabill I3 Jacket includes an integrated Self-Rescue device over the shoulders, ensuring that the ice picks are easily accessible should I fall through a thin spot. Integrated drainage mesh in my Frabill I3 suit also allows any water that accumulates in the suit to drain rapidly away. Creepers, or some other sort of traction-enhancing device for your feet, are also useful tools for the early season ice angler. The first ice of the season is often free of snow cover, quite flat, and extremely slippery. Falls on the ice can lead to bumps, bruises, sprains, or worse, and increasing the traction of your footwear can help to minimize these injuries. Be conservative when venturing onto early season ice. No fish is worth your life. Those fish will remain in the same general areas for a couple of weeks, so don’t rush prematurely onto an unsafe crust of ice; wait until conditions permit you to enjoy the first ice period while staying safe and dry. First ice is NOT the time to haul your snow machine or hard-sided ice house to the lake. You will be traveling on foot, and you don’t want to be weighed down pulling hundreds of pounds of gear in pursuit of a hot early-ice bite. I limit my load to those items that I can fit comfortably into a medium sized sled. If it doesn’t fit, it stays in the truck. Here are the key items that always make the cut. I bring two pieces of ice electronics with me on every ice adventure; one of these is a Humminbird sonar/GPS combo, like the HELIX 5 ICE or ICE 688ci HD Combo. These multi-functional pieces of electronics allow me to walk to the fishing grounds with GPS precision, and target the fish lingering there with either a traditional flasher-wheel sonar display or an “open water” view that is rich in historical sonar information. The second piece of must-have ice electronics is my Aqua-Vu Micro 5 camera. This compact underwater viewing device fits perfectly in the front pocket of my Frabill I3 bibs, and features a long-life Lithium Ion battery that provides for many hours of continuous use. I use my underwater camera to identify the fish I observe on my sonar, find green weeds along expansive weed edges, and even monitor baits suspended under tip-ups to learn how fish are reacting to them. I pack a lightweight, portable shelter on early ice trips. This can take the form of a one-angler flip-over, like the Frabill Recruit 1250, which also provides the sled that I use to transport all of my gear. Unique design features of the Recruit 1250 provide me with more fishable area than other one-angler flip-over shelters, and also incorporates a full thermal shell to ensure a warm, comfortable day on early ice. If I’m fishing with a friend, I trade my flip-over for a thermal hub, like the Frabill Bro Hub which provides plenty of room for two anglers plus all of their gear, and an expansive 80″ of headroom to allow for a good stand-up-and-stretch when the bite slows. Weighing in at just 36 pounds, the Bro Hub is easy to transport to and from the fishing grounds. Beyond my electronics and shelter, everything else that I carry, including rods in a hard case to keep them safe and secure, essential tackle and tools, tip-ups when chasing fish with teeth, an assortment of live bait, and snacks and drinks, all need to fit into that single sled. If you minimize the amount of gear you bring on early ice trips, you’ll be more likely to remain mobile on the ice, and mobility is the key to success for the modern ice angler. The early ice period features one of the best near-shore, shallow water bites of the ice season. Those waters remain well oxygenated from fall winds and rains, and any shallow cover like weeds, rocks or timber will rapidly accumulate baitfish populations, as well as the gamefish and panfish that feast upon them. Now is the time to target those fish, before they vacate the shallows and head to the primary breaklines or the deep basin. Shallow fish are generally more active, and respond more favorably to aggressive presentations, than their deep water cousins. 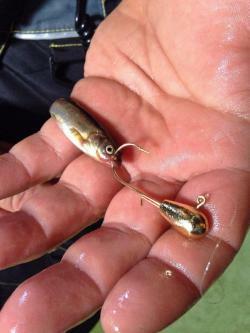 Now is not the time for micro baits rigged on the tiniest tungsten jig that money can buy. I favor larger profile, high-action baits like the soft-plastic Ratso or the Slender Spoon from Custom Jigs and Spins. There is generally no need to tip the Ratso with any sort of live bait, as the supple action of the long Ratso tail is all that an angler needs to trigger bites. Likewise, if you plan to accessorize the Slender Spoon with an organic bait, limit that to only a minnow head, as an entire minnow will deaden the tantalizing flutter of the often imitated, but never duplicated, Slender Spoon. When you’re fishing the Slender Spoon under low light conditions, be sure to tie on a Pro-Glow Slender Spoon, and supercharge that spoon with a small LED light to enhance the bait’s appeal to crappies or walleyes lurking beneath the lake’s frozen cap. Yes, I know there are crappies suspended out over the basin. And yes, I recognize there are probably some walleyes on that mid-lake rockpile. However, I hate to walk past catchable fish to find other fish that are much farther away, so I plan to take advantage of this early ice, shallow water bite for as long as it lasts. We’ll have plenty of opportunities to retool for offshore adventures as the winter progresses. This entry was posted in Ice Fishing on December 4, 2015 by ronniegarrison. What Is Hop Drop and Troll Ice Fishing? Crappies aren’t necessarily hard to catch, but they can be challenging to locate on vast waters like Minnesota’s Lake of the Woods. Dan Stefanich photo. In smaller, shallower lakes, crappies are typically located and caught throughout much of the winter season over main-lake basins. In large, deep lakes, however, they tend to avoid the deepest areas and use flats, humps and basins ranging from 20 to 40 feet deep. But crappies are also notorious for suspending. Depending upon conditions, they can be found anywhere in the water column, creating an additional variable in the angling equation. As the ice-fishing season nears its end, crappies transition from their deepwater wintering areas towards shallow bays, channels and river mouths in preparation for spawning. Depending on where and when you fish, concentrations of crappies will be present along a relatively straight line between these distinct areas. During the late-ice period, take a stab at identifying some of these likely travel paths between wintering areas and spawning areas on a map of the lake you plan to fish. Look for potential staging locations where cover, structure or current variations are present along those paths. Jigging spoons are a great choice for targeting crappies in most situations. This one fell for a Custom Jigs and Spins Slender Spoon in Gold/Glow. Dan Stefanich Photo. Once you’ve identified attractive areas, gas up the auger and get to work. Use your GPS to confirm your location on the ice, and pick a variety of sweet spots over the particular structure you plan to fish. A larger fishing party is beneficial because you can share the work of drilling holes and checking them for fish with sonar. Once you mark fish, take the time to drill more holes. It’ll save you time in the long run as you’ll waste less time fishing an unproductive hole when an entire school may be located just 10 or 15 feet away. Once the crappies are located, hole hopping is the key to keeping busy catching them. “Here on Lake of the Woods, the guys who are willing to leave the comfort of their fish houses and use their electronics to fish from hole to hole are the ones who catch the most crappies,” says Lake of the Woods Minnesota Tourism director and avid angler, Joe Henry. Effective as it may be, hole hopping requires some specialized gear – especially at the very top of the continental United States on Lake of the Woods, where daytime temperatures can often remain below zero. Quality boots and outerwear are a must. A piece of gear like Frabill’s Tackle Pack-Hand Muff is also indispensable, keeping tackle organized and at the ready, while also serving as a vital and cozy refuge for off-duty hands. Crappies display a variety of moods, and their responsiveness to various presentations can change throughout the day – often rapidly. Late-ice crappie anglers should be prepared with a variety of offerings, from small tungsten jigs tipped with thin plastics to relatively large jigging spoons. Frabill’s Tackle Pack-Hand Muff is engineered for hole hopping, combining convenient and mobile tackle storage with hand- and core-warming technology. “When crappies are aggressive, it’s hard to beat a Slender Spoon or a Buckshot Rattle Spoon tipped with a minnow head or tail,” says Henry, who prefers variations of gold and glow red for Lake of the Woods’ stained waters. When a fish is showing on sonar, Henry advises stopping the spoon 4 to 5 feet above it and slowly working it down if necessary. “A lot of times you’ll see the fish begin drifting up towards your bait immediately,” Henry says. “If they do that, I’ll slowly raise the spoon while twitching it ever so slightly and make them chase it… Once you get them moving, they’ll usually charge it,” he continues. Aside from a jigging spoon’s larger profile, Henry prefers them for another reason. “Spoons fish heavy,” he says, referring to their ability to punch through a slushy hole and get back down to other fish quickly once one has been caught. “If you’re marking a fish down there, a spoon is going to get down to it quickly… hopefully before it leaves,” he adds. Crappies aren’t usually too difficult to catch. But they can be hard to locate, especially on a vast piece of water. Do your homework ahead of time, be willing to drill a lot of holes, fish fast and move if necessary. Some call it ice trolling because of the amount of water one can cover this way in a single day. Of course, if you really want to tip the odds in your favor, consider hiring a guide or consider fishing out of a full-service lodge. At over one million acres, Lake of the Woods, Minnesota is a prolific fishery. Best known for its walleye, sauger, yellow perch and northern pike – all of which can be caught in great numbers all winter long from the comfort of countless heated ice houses placed and maintained by a number of full-service lodges – Lake of the Woods is also one of North America’s best trophy crappie fisheries. With over one million acres and numerous full service lodges, Lake of the Woods, Minnesota is a premier angling destination. 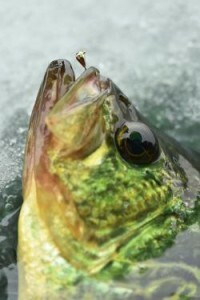 Walleye ice fishing season runs through the end of March on Lake of the Woods, while crappie fishing extends in to April. Dan Stefanich photo. Crappie fishing at Lake of the Woods, however, takes a bit more work and planning. Some of the best crappie fishing on the lake takes place around the Northwest Angle, a thin strip of U.S. land and water extending north into Canada. “Crappie anglers interested in coming to Lake of the Woods should consider staying at one of the lodges up at the Northwest Angle,” says Henry. There are several lodges to choose from, and any of them will work with you to meet your specific angling objectives. Most use classic and reliable Bombardier track vehicles to transport their customers. It’s a unique experience that adds value to an already exceptional fishing trip. “They’ll get you comfortably to and from the best bites, which may be in Minnesota or Canadian waters,” continues Henry. Sliding up into Canada is a relatively easy option for anyone traveling to the Northwest Angle. Canadian fishing licenses are easy to obtain at the lodge, and a simple phone call to Canadian authorities is all that’s needed to gain legal entry for fishing – for walleye, pike, muskie, perch or, of course, slab Canadian crappies. 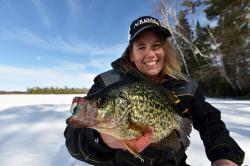 Ice fishing for crappies extends into April at Lake of the Woods, providing yet another super reason to visit this outstanding angling destination. For more information, call Joe Henry at Lake of the Woods Tourism at 800-382-FISH (3474), email info@lakeofthewoodsmn.com, or visit www.lakeofthewoodsmn.com. Be sure to ask about walleye, sturgeon and other four-season angling opportunities, too. This entry was posted in How To Fish, Ice Fishing on March 13, 2015 by ronniegarrison. Is A Jig and Minnow the Best Walleye Bait When Ice Fishing? Bushey’s one-two punch also includes a Custom Jigs & Spins Vertiglo Lightning Spoon, which features long-lasting glow for low light or stained water situations. In two-line situations throughout North-Central Ontario – and much of the continental Ice Belt for that matter — not much beats a jig and minnow combination for scraping extra walleye off the spots you jig. Spoons, rattle baits and other lures bring fish under you, and a lively dace, chub or golden shiner set up nearby adds a whole other angle to your game. Struggling against the weight of a lead ball in its nose or back, a minnow rigged this way is just too easy for a walleye to eat. Inside a shelter, rig up a horizontal rod holder and set your drag to slip a little if a good fish scoops up the jig and minnow when you’re not looking. I like shorter rods, from 26 to 32 inches long with a soft tip. A bouncy tip shows what your minnow is doing at all times and gives walleyes a cushion when they pick the bait up. You’ll see them hit before they feel the rod. Set the hook by simply lifting firmly and reeling. A good jig hook slips right in, without much effort. 1. A sharp, fine-wire Mustad hook does minimal damage to live minnows, so they stay frisky and looking for trouble. 2. They’re available in huge varieties of weights and colors. They’re one of the few companies that makes a true, gold plated jig head. In the tannin/iron-stained lakes in northern Ontario, this color is just aces for me. Tip-ups with live minnows generate tons of walleye all winter for us too, but nothing beats watching a fish hit right beside you and then fighting it on a light rod and reel outfit. Of course, look for walleye on your sonar as you jig with more aggressive lures. You’ll be impressed by how many respond to the jig and minnow. Methods like the jig and meat combo start to shine right about now, when cold snaps start getting measured in weeks and that first-freeze rush has kind of petered out. Walleye are still absolutely catchable using lures with more razzle dazzle, stroked quicker. But season after season, batting cleanup with a well-placed baitfish gets hotter and hotter the colder it gets. What’s nice about these colder periods is they force me into moving around less and slowing my entire approach way down. How is that even remotely a good thing? For one, camping out on good spots really lends itself to being thorough, meticulous and maximizing what I’m doing. There’s nothing better suited to soaking great structure than a baited jig. Use the cold and rougher travel to your advantage. Ma Nature wants to pin me down all day with huge wind chill or deep slush all over the lake? No problem. I’ll set up on a sweet spot and kill it softly. Don’t fight the bite. If things slow down or you’re unable to be as mobile as you’d like, capitalize on it. The author is a fan of B FISH N Tackle’s H2O Precision Jigs – and points to their sharp, fine-wire Mustad hooks and myriad color and weight options. He also thinks their gold finish trumps all others in tannic waters. Adding the smell and taste of “meat” to a H20 jig can be the final touch in turning lookers into biters. You’ll love the way a jig and bait buries its chances. Walleye eat it and hooking/landing percentages are almost perfect. It’s a key method for mid-winter fishing and a terrific slump-breaker, too. If you’re marking walleye that won’t eat spoons or other lures, send one down, believe me. On your Solunar events or during light changes (daylight to dusk will always be a top one), having this type of tool ready to use makes a huge, huge difference, in terms of walleye caught. It’s really that simple. It’s worth noting that while walleye in the inland lakes we fish ‘up north’ love the jig and minnow, so too do our big water fish, in places like Georgian Bay and The Bay of Quinte. If you fish anywhere along Ontario’s Trent-Severn system, in the Muskokasor on that big beauty they call Lake Nipissing, get a couple different jig and minnow rods set up and play them. JP Bushey is a fishing educator and syndicated fishing columnist living in Barrie, Ontario. North-central Ontario is where he spends the bulk of his time on water and ice, from Lake Ontario’s Bay of Quinte to the spawning, Georgian Bay and all points in between. This entry was posted in Ice Fishing on February 21, 2015 by ronniegarrison. Can I Catch Trout Through the Ice In Small Waters? Trout provide fine ice fishing action across the North, but in many areas of the country, large, deep lakes don’t develop a trustworthy coating of ice until well after Christmas. Good news is, opportunities abound to enjoy fast action on smaller, quick-freezing lakes guaranteed to deliver a welcome dose of holiday cheer. “In Colorado, our big, high-mountain lakes generally don’t freeze until Christmas,” reports veteran Rocky Mountain trout guide Bernie Keefe, but this expert says smaller lakes are a different picture. “Lakes ranging from 100 to 500 acres in size are ideal because you can easily cover them on foot,” he says. Pre-trip scouting begins at state fisheries department websites, which often offer detailed information on fish numbers and sizes, along with helpful hydrographic maps. Keep in mind, lakes with relatively simple structure are easier to search than those with multiple reefs, points and other trout-attracting features. Why wait for big lakes to freeze when small waters offer opportunities for a variety of trout and salmon? Carefully testing the ice with a spud bar as he goes, Keefe ventures out in search of prime lies such as shoreline points and lush green weedbeds. “The inside edge of the weeds is typically hot right now, but open pockets are always worth checking, too,” he says, noting that thin ice and clear water often enable visual recon without chipping or drilling. Swimming hardbaits such as Clam’s Psycho Shad are deadly on early-winter trout. While spoons are a stellar option, swimming hardbaits such as Clam’s Psycho Shad are also deadly weapons for luring in winter trout. After a strike or two, Keefe focuses his efforts on the depth at which the trout hit. “It tells me the level at which the fish are cruising,” he explains. His second hole holds a deadstick presentation. “A 1/16-ounce marabou jig or Clam Duckbill drop is tough to beat,” he says. “But a Clam Half Ant can be dynamite when trout are keying on a horizontal bait.” Deadstick tippings consist of two or three waxies threaded onto the hook so they dangle temptingly while oozing scent into the surrounding water. If trout are cruising the area, it usually doesn’t take long for fish to move in and check out Keefe’s wares. “If nothing shows up within half an hour, I pull up stakes and move on,” he says. Keefe’s small-lake pattern holds water well into January, when dying shoreline weeds push trout into deeper water offshore. “The same tactics apply, you just have to walk our farther to find the fish,” he notes. Until the migration begins, however, the shallow-water shoreline bite is a great way to put a mixed bag of tasty trout on ice. This entry was posted in Ice Fishing, Trout and Salmon on February 9, 2015 by ronniegarrison. Today’s feature, on what it takes to get started in ice fishing, comes to us from the Michigan Department of Natural Resources. Fishing is a year-round activity and when the thermometer plunges below freezing for prolonged periods, most anglers have little choice but to hit the hard water. Ice fishing becomes the go-to activity until spring. For beginning anglers, ice fishing offers one significant advantage: access. Boat-less anglers, who otherwise are limited to shorelines or fishing piers much of the year, can often access entire lakes. That inspires some anglers to proclaim that ice-fishing season is their favorite time of year. Fortunately, ice fishing can be relatively simple. All that’s needed to start is a way to make a hole in the ice (an auger or spud), a way to clear the slush from it (an inexpensive scoop), and rudimentary equipment. There’s a good opportunity coming soon. 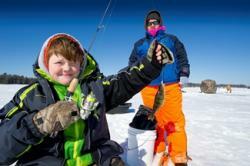 Feb.14-15 is Michigan’s annual Winter Free Fishing Weekend, when no license is needed to participate. There are hands-on educational events scheduled at a number of areas. In addition, the Carl T. Johnson Hunting and Fishing Center in Cadillac holds on-the-ice fishing events every Saturday at noon. Novice anglers often can find assistance nearby. Tom Goniea, a fisheries biologist at the Department of Natural Resources, says finding a mentor helps shorten the learning curve. “Ask around,” Goniea said. “Ask the guys at work or the folks at church. Ice fishermen make up a community that’s usually quite willing to introduce others to the sport. DNR fisheries biologist Christian LeSage agrees. Except for largemouth and smallmouth bass – bass season closes Jan. 1 and doesn’t completely reopen until the Saturday before Memorial Day – anglers who ice fish can pursue all species they target the rest of the year. Ice fishing can range from fishing for panfish on a farm pond to making miles-long sojourns on the Great Lakes in pursuit of walleyes, lake trout or other top-of-the-food-chain predators. LeSage recommends people start with panfish. He likes bluegills. “You can try it on a small pond in a park,” he said. “And you don’t need extravagant gear. If you go places where people have been fishing, you don’t even need an auger – you can reopen a hole with a hammer. What’s nicest about bluegills is that they can be found almost everywhere and, as fishing quarry, are relatively unsophisticated. All you need is a basic gear. Small fiberglass rods with simple, spring-tension spoons can be yours for less than $10 and you will see accomplished ice anglers using them. Add some light line, a few low-cost tear drops (small weighted hooks) and a container of insect larvae (wax worms or spikes, the early life stages of bee moths or flies, respectively) and you’re in business. Lower your bait to the bottom, begin slowly working it upward in the water column until you start getting bites, and then fish at that depth. It can (and does) get much more complicated with expensive rods, sonar fish finders, and a plethora of other equipment. But many anglers never acquire all that gear and continue to enjoy productive bluegill fishing. 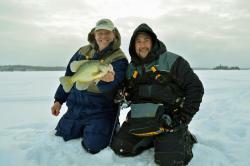 As you progress in the sport and explore other ice-fishing opportunities, the equation becomes decidedly more complex. Get addicted to walleye fishing and you’ll be into snowmobile or quad runners, insulated ice shanties, GPS, underwater cameras – the list is endless. But some factors never change: The first rule of ice fishing is to be safe. Good, strong ice can support a semi-truck, but every year there are tragedies that often involve recklessness. Make sure the ice is safe. Even arctic temperatures won’t guarantee it, especially if there’s an insulating layer of snow on top. You can get up-to-date info from bait shops around fishing locales, but always make sure yourself. Carry a spud to test the ice in front of you as you venture forth. Don’t approach ice that is discolored or has objects (such as vegetation or timber) protruding through it. Be especially careful of rivers (current can degrade ice quickly) or spring-fed lakes and ponds where warmer water can cause thin spots in an otherwise solid surface. Always carry basic emergency gear, just in case. Ice picks (or homemade alternatives constructed of nails in dowels) will give you a way to get purchase on the ice should you break through. Carry a rope to toss to someone else who breaks through. It’s better – some would say mandatory – not to go alone. You certainly don’t want to head miles off shore – at Saginaw Bay, say, or Little Bay de Noc – without a partner. Always make sure someone knows where you are going and when you plan to return. Carry your cell phone. Make sure you dress for the weather. Dress in layers from head to toe – the best way to keep your feet warm is to keep your head warm – and a waterproof outer layer is advisable. Small luxuries – such as extra gloves and hand warmers – often pay large dividends. Ice fishing isn’t for everybody. But if you look around in the winter and see the huge shanty towns that spring up on some of Michigan’s best fishing lakes, it’s obvious that a lot of people are having a lot of fun out there. It isn’t that difficult to become one of them. For more information on ice fishing, visit the DNR’s website at www.michigan.gov/fishing. This entry was posted in Ice Fishing on February 3, 2015 by ronniegarrison.